Dry Fog systems are very effective at eliminating dust in ROM bins. Using the larger nozzles in the range, even with larger bins the truck dump can be adequately filled with fog and can tackle fugitive dust both with the initial tip or belly dump, and with the air displacement due to the dump mass. Nozzles are typically mounted in multi-directional housings in manifolds around the sides of the bin, where practicable, and fill the entire bin with dry fog. Small wind fence sections can also be installed where practicable, protecting the fog from wind effect and allowing the agglomeration process to happen without disturbance if the ROM bin is in an exposed or elevated position. Dry Fog can also be combined with water spray systems if conditioning of the product to raise the moisture levels to close to DEM values is required – fan type water sprays can also be used to spray over the top of the fog to assist in preventing the fog escaping the bin. Water spray systems only are typically the go-to solution for ROM bins, but they do little other than wet the product and will not tackle PM10 or PM2.5 dust by nature of the water droplet size that the sprays produce. 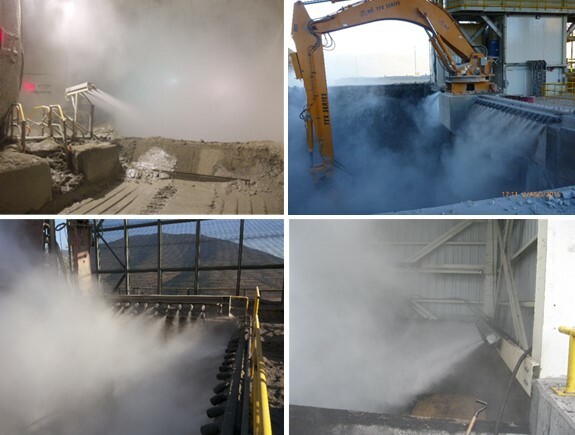 Similarly, high pressure misting systems can be effective in eliminating visible dust, but these still use a large amount of water in comparison to dry fog, and produce a water particle size greater than 10 microns (at best, around 30 microns), which will not eradicate respirable dust in the sub-10 micron range by agglomeration. Dust Solutions Inc’s dry fog systems also incorporate a blue block system, which allows multiple circuits to be run from the same cabinet. This means that nozzles on a separate circuit for dust control at discharge conveyors or apron feeders can be achieved economically. A single dual filtration unit, control circuitry (including PLC control or dry contacts if required) and all solenoids for these systems are mounted in one cabinet which saves on overall costs. No other supplier uses this unique design, and it means we can offer a solution that costs less and requires less maintenance.